There are three Comfort Inn Galveston Hotels along the Galveston beach. They may not be under the same company but their simplicity is similar. 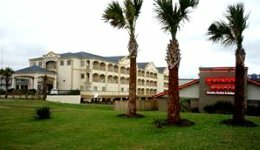 The Comfort Inn & Suites Stewart Beach is on the east side of the Galveston seawall. The 3 floor 63 room hotel is not very far from the beach. The distance to the Stewart Beach could be about 400 meters. The location of the Comfort Inn Galveston hotel is advantageous tofolks wanting to go on Galveston cruises. The hotel permits cruise parking but it's better to find out about the details involved. The down town is a few minutes away so it's a perfect location for shoppers at the Strand district. One great attraction close this place is the Galveston Ferry boat ride. Less traffic is seen because of the hotel's location. Gulf view is very rare. Visitors might have to ask to get it. There is no walk-in restaurants around the corner but the hotel has a Complimentary Continental Breakfast. The nearest restaurants include Wings, Chilis and Gorditas Mexico. These are about 5 minutes drive from the hotel. Comfort Inn & Suites Stewart Beach 102 E. Seawall Blvd. 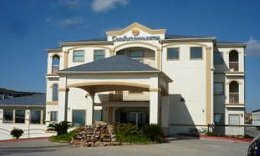 This Comfort Inn Galveston hotel is in the middle part of the seawall near to the very busy 61st street. It is not very crowded except for traffic noise day time. The summer evenings can be boisterous for a while. Gulf view rooms are not available here. The beachfront hotel is much closer to the Galveston Flight Museum, Moody Garden and Waterpark than some other hotels. Driving to other tour sites could take about 25 minutes. The beach is right in front of the hotel and it's less congested during summer seasons. Seawall strolling is more relaxed around this area than the Stewart beach area. Continental breakfast is regular at the hotel and there are more restaurants like Luby's, Popeyes, McDonalds and Golden Corrals nearby. This Comfort Inn Galveston Hotel is perfect especially for those who love buffet restaurants like the Golden Corrals. The Comfort Suites is almost at the west end of the seawall but much closer to the Moody Gardens. The 3 floor hotel is about 500 meters from the sea. lt may not offer much view of the gulf because of its lower elevation. However the Comfort Inn Galveston suites will be a great choice for a peaceful place to stay. This area is less populated. The hotel has a continental breakfast but most restaurants are within a driving distance. The closest attraction to this location is the Moody Gardens.